The City of Good Neighbors scores some points with out-of-towners visiting for the Frozen Four. "We're just going around doing some random acts of kindness, and I'd like to buy you a beer." One small good deed can go a long way. That's the hope of Visit Buffalo Niagara. 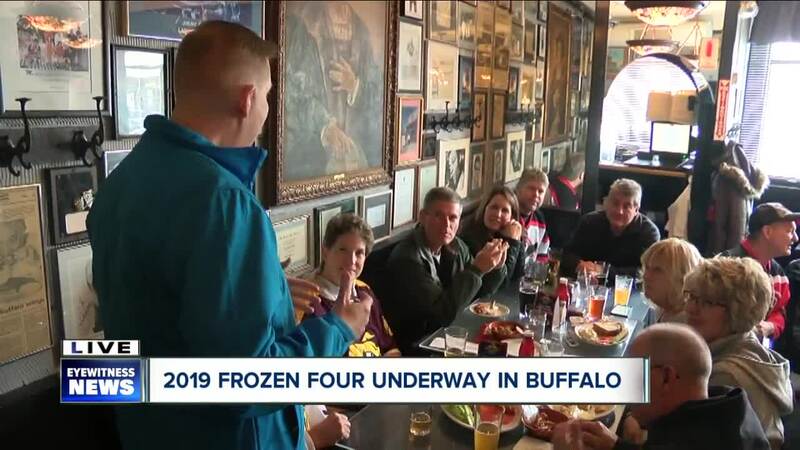 Before the first game of the Frozen Four, the college hockey equivalent of the basketball Final Four, some lucky fans were treated to a free meal. "(We) showed them some good hospitality from Buffalo. We are the City of Good Neighbors, and we like to show that off," Patrick Kaler, the President of Visit Buffalo Niagara, said. With thousands of people coming to Buffalo, Kaler said he wanted to capitalize on an opportunity to promote the Queen City. "So for us to really take advantage of that, especially as a second or third tier destination, to really show our hospitality," he said. College hockey fans from all over the country are hearhere to see some of the nation's best teams play. However, that's not all. As the saying goes, "when in Buffalo, do as the Buffalonians do." "10. they are some of the best wings I’ve ever had,” one fan from Cedar Rapids, Iowa, said. Anchor Bar was packed in the afternoon with people eager to eat as many wings as they could. "We just went for the 50 plus another 50 and a few suds,” Kyle Heagney, a Providence College fan from Boston, said. The Frozen Four continues through the weekend. Here is the schedule. Semi final: Minnesota Duluth vs. Providence at 5 p.m. on 4/11. Semi final: Denver vs. UMass at 8 p.m. on 4/11.